Posted on August 5, 2016 by David L. Hudson Jr.
Mary Beth and John Tinker continue to add their historic voices to discussions about student speech and First Amendment rights. 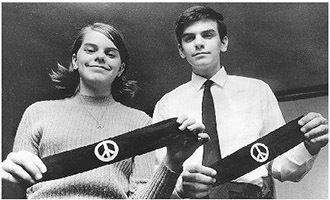 In that ruling, the justices said Mary Beth, John, and the late Christopher Eckhardt had a right to wear black armbands with the “peace” symbol to their public schools in Iowa to protest the Vietnam War, support Robert Kennedy’s Christmas truce, and to mourn those who had died in the conflict. The Court created what is known as the “Tinker standard” – that public school officials can censor student-initiated expression only if they can reasonably forecast that the student expression will cause a substantial disruption of school activities or invade the rights of others. The Supreme Court explained that Iowa school officials acted more out of “undifferentiated fear or apprehension of disturbance” rather than any real facts showing that the armbands might cause significant problems – which they did not. Both views are correct. The Tinker ruling remains the seminal U.S. Supreme Court decision on student free-speech rights. Only Justice Clarence Thomas among sitting Supreme Court justices has called for the case to be overruled. However, it is also true that student rights have been eroded. In a series of later decisions – Bethel Sch. Dist. v. Fraser (1986), Hazelwood Sch. Dist. v. Kuhlmeier (1988), and Morse v. Frederick (2007) – the Court carved out exceptions to Tinker for vulgar and lewd student speech, school-sponsored student speech, and student speech that school officials reasonably believe promotes the illegal use of drugs. Students have been punished for wearing t-shirts of the American flag, bracelets supporting awareness of breast cancer, and for online speech created entirely off-campus. Fortunately, students sometimes prevail in free-speech disputes but often only after facing punishment and having to threaten or initiate litigation. School officials need to ensure a safe learning environment but also must respect student constitutional rights, including the right to free speech. David L. Hudson, Jr., the Ombudsman for the Newseum Institute First Amendment Center, is the author of Let The Students Speak! : A History of the Fight for Freedom of Expression in American Schools. http://www.beacon.org/Let-the-Students-Speak-P769.aspx He also spoke at the conference in Boston. I admire the Tinkers to this day. Their experiences remind me of several groundbreaking suits which continue to help my clients and me reach peace and justice in our lives. I’m a big fan—the Tinkers continue to break ground for me every day. Nice article, David Hudson. But you forgot to mention that your talk on student rights today- and teachers’ rights-was a real highlight there as well! Thanks, David!